● Microprocessor-controlled with advanced safety features. ● Three test voltages : 250 / 500 / 1000V. 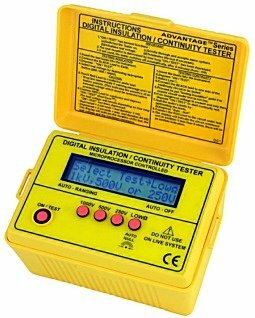 ● Displays and sound warning if external voltage present. ● Auto ranging / auto-null / auto-off. ● Insulation tested at 1mA. ● Built-in carry case, test leads in separate pouch. ● Audible and visual message displayed if external voltage is present.